Strangers Collective’s NO LAND art space transforms into a futuristic planetarium for its inaugural exhibition. In his solo show Ya Veo, Marcus Zúñiga incorporates cosmic imagery into new media projections and sculptures, opening windows into the universe by manipulating footage that he captures through a telescope. Mapping the constellations has helped Zúñiga trace his Mexican-American roots—and tell a story that traverses human history. Ya Veo, meaning “I see” in Spanish, is an invitation to viewers to ponder their place in the universe. The debut of the show on April 8 coincided with the grand opening of NO LAND on Saturday, April 8 from 6-9 pm, and it runs through June 10, 2017. Zúñiga conducted an artist talk at NO LAND on Saturday, April 15, 6 pm. The exhibition's closing reception (June 10, 6-9 pm) coincides with the opening weekend of the Currents New Media Festival 2017. The two-week festival features new media art from across the world, and partners with art spaces around Santa Fe to present satellite shows and events. “My work is about perception of the universe,” says Zúñiga. “It’s part of a conversation that spans millennia, and can’t be resolved with a simple yes or no.” He first tuned into this cosmic exchange as a child growing up in New Mexico. Zúñiga was born in Silver City, and his family lived in seven different towns throughout the state during his youth. “I would win science fairs with projects about the solar system, and watch eight-hour documentaries on the chemical compositions of stars,” Zúñiga says. He was excited to learn that his Aztec ancestors were equally attracted to studying the stars. Perhaps cracking cosmological mysteries could help him understand his own DNA. In 2009, Zúñiga enrolled at the University of New Mexico to study video art. “I never pursued astronomy seriously because it always seemed too dry to think about it in a very scientific way,” he says. “Through art, I could experience concepts of the universe—and create those experiences. That’s what set me off.” Near the end of his time at UNM, he created a video collage of a hawk in flight overlaid on the sun. The piece felt like a breakthrough, and he tried to replicate its success after graduating with his BFA in 2013 and taking an internship at the Museum of Contemporary Art, Tucson. It wasn’t until he moved to Santa Fe in summer 2014 that his first body of work started to take shape. After completing an internship with SITE Santa Fe, he took a job at Peters Projects, and connected with new media artists who became his mentors. “Peters had this five-monitor installation by Steina Vasulka,” he says. “It was an electronic, monumental piece with a very Fluxus feel to it. 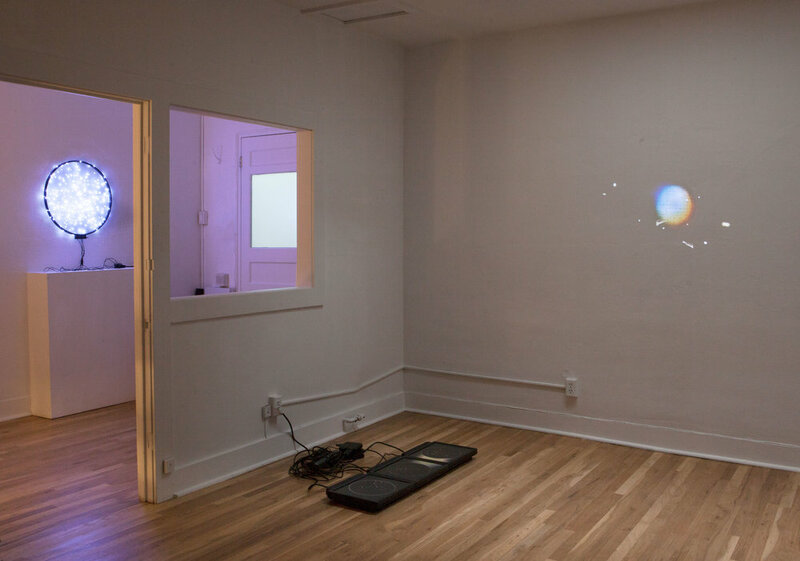 The fact that a gallery was supporting experimental art, that showed me new possibilities.” Another new media work by Lita Albuquerque inspired him to study her efforts to bring serious scientific conversations into the art world. Ya Veo, Zúñiga’s first solo exhibition, represents two years of astronomical exploration. The eight works in the show include videos, photographs and new media sculptures. High quality prints will also be available for purchase. “Strangers Collective’s goal with the NO LAND project is to spotlight emerging artists who are ready for the next phase of their careers,” says Kyle Farrell, co-director of NO LAND. “Marcus showed us this rich, diverse body of work that is conceptually rigorous but also captures unbridled wonder.” He is currently in preparations to participate in the Art Center College of Design Graduate Art MFA program in Pasadena, CA for the fall 2017 term. Zúñiga has appeared in two Strangers Collective group shows: Narrows at Santa Fe Community Gallery in spring 2016, and Long Echo at Center for Contemporary Arts in fall 2016. For more information and high resolution images, please contact NO LAND co-directors Jordan Eddy, Alex Gill and Kyle Farrell at strangersartcollective@gmail.com.